Harry N. Abrams, 9781419728594, 144pp. "Potter gives her amusing and adventurous plot just the right amount of detail to bring it to life, as do Sala’s simple line drawings. This warmhearted new series, particularly suited for reluctant readers or chapter-book newbies, promises more laughs and exploits from the entertainingly paired Hugo and Boone." "Young readers will enjoy this story of an unlikely friendship and may especially like the Sasquatch characters and setting, which are impressively well developed. The gentle humor throughout is sure to entertain. Sala’s charming illustrations only add to the appeal. VERDICT Established chapter book author Potter delivers another winner with this series opener." 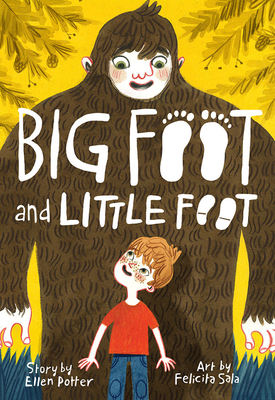 "Potter keeps the third-person narrative tightly focused on Hugo's perspective, and the details she uses to flesh out the Sasquatch world are delightfully playful . . . A charming friendship story and great setup for future books." "The easy-to-follow plot is engaging, humorous, and sweet."